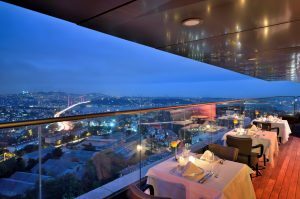 Mercure Istanbul The Plaza Bosphorus is located in the heart of Istanbul and close to business centers like Levent, Şişli and Maslak. The Zorlu Center, Cevahir, Kanyon and Metrocity shopping malls are few minutes from the hotel. It offers you stylish and comfortable rooms overlooking this beautiful city. This hotel make its guests feel like at home with its warm and well decorated lobby and rooms. The guests can also work at Business Center which is open 24 hours and sport at well-equipped fitness center of the hotel. This luxury hotel fully reflects the spirit of the city while offering its guests professional services and peaceful ambiance. 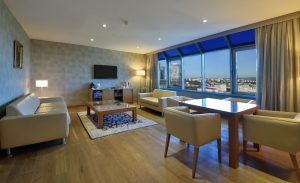 Enjoy sophisticated rooms and suites, first-class leisure facilities and amazing view of the city.